afrol News, 19 January - Africa produces nearly 30 million tons of bananas yearly, which is mostly consumed locally. But production is already being reduced and may very well cease entirely within ten years, scientists warn. Because existing banana plants are reproduced from cuttings, there is little genetic diversity. Diseases, in particular fungus, rapidly can wipe out entire production regions. In a report published in yesterday's issue of the British weekly 'New Scientist' magazine, Belgian plant expert Emile Frison warns against the treats against one of Africa's most important food crops. Mr Frison is head of the International Network for the Improvement of Banana and Plantain (INIBAP) in Montpellier, France. The scientist warns banana diseases are becoming increasingly difficult to control. "As soon as you bring in a new fungicide, they develop resistance," he told the British magazine. This is not science fiction, as history shows. In the 1950s, a relentless soil fungus called Panama disease wiped out the then dominant banana variety, Gros Michel. According to INIBAP, today's supermarket banana, the Cavendish variety, as well as 99.9 percent of all other banana varieties consumed throughout the world, are the descendants of a long line of varieties that have been selected by generations of farmers, making it extremely vulnerable for plant diseases. Unlike other major staples, only a tiny fraction of the world crop is harvested from improved varieties that have been created by breeding programmes. Now, a new variety of the Panama disease is back, increasingly destroying Cavendish banana plantations all over the world. Even worse, though, is the rapidly spreading fungus, known as 'Black Sigatoka', which is attacking the banana plant itself. Black Sigatoka has already cut crop yields by 40 percent in Uganda, the world's second largest banana producer, only next to India. The fungus epidemic started in Fiji in 1963 and has now spread to all major banana producing regions. "As soon as you bring in a new fungicide, they develop resistance," Mr Frison said. "One thing we can be sure of is that the Sigatoka won't lose in this battle!" Attacking all major varieties of bananas and plantains, Black Sigatoka turns the plant's leaves a mottled yellow, brown and black, thus impeding photosynthesis, explains researcher Michelle Hibler. "Depleted of its energy reserves, the plant cuts back its fruit production, often to half. For exporters, Black Sigatoka is ruinous: the disease also causes premature ripening of the fruit. Although they appear normal, bananas from affected plants ripen and spoil before arriving at markets." The problem is at the heart of the industry. The wild banana is almost inedible, as it is riddled with stony seeds. One assumes that early hunter-gatherers in South-east Asia stumbled across a rare mutant plant that produced seedless, edible fruit, which is the forefather of all fruits on today's banana orchards. From this origin, the banana was introduced to Africa, via Zanzibar and Madagascar, some 3000 years ago, and later to the rest of the world. The mutant plants are sterile. Being reproduced from cuttings and not from seeds, almost all plants virtually are clones of each other, representing a minimum of genetic variety. Despite its importance as a staple food and income source for developing countries, "surprisingly little investment has been made in research in the past," INIBAP says. Commercial interests in breeding better bananas had "waned after many failed attempts," because banana is a particularly difficult crop to breed on account of its sterility and lack of seeds. In many regions of Africa and other developing countries, the banana is the principal staple crop. Of the entire global production, less than 15 percent leaves the countries where it is produced, INIBAP says. If the plants are wiped out, scientists say this will result in food shortages. The shortages are already noted in the Great Lakes region, which accounts for more than half of Africa's banana production. Kenya has noted a rapid decline in banana production over the last 20 years, mostly due to pests and diseases. In Uganda, production has nearly halved, and the trends are similar in Tanzania, Rwanda and Burundi; countries where the banana is a major calorie source. The majority of banana farmers in East and Central Africa are women. From their banana sales, these women have been able to improve their socio-economic welfare through paying school fees for their children, improving family nutrition and building water tanks to store clean water, according to an INIBAP study. Western Africa, in particular Cameroon, Ghana, Nigeria and Côte d'Ivoire, is the second largest banana production zone in Africa. Also here, consume is mostly domestic, and large parts of society depend on banana as a major food source. Present in West Africa since the 1980s, Black Sigatoka is already causing yield losses of 30 to 50 percent in banana and plantain production in south-eastern Nigeria. There is some hope, however. In Honduras, scientists from the banana industry have concluded large-scale breeding schemes resulting in the new FHIA variety. 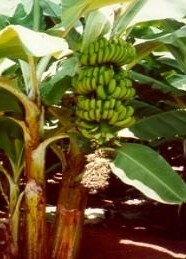 Being resistant to major diseases and pests, the FHIA banana also is highly productive and has good shipping qualities. Trial plantations in the Caribbean and Africa have proven successful, especially when it comes to cut the costs of fungicides and pesticides. If the copyright holders of the FHIA's genes - the Honduran project is financed by the multinational United Brands - permit a free spread of the variety, FIAH may signify a solution for those communities in developing countries depending on bananas as a source of nutrition. Early estimates put the cost of the new hybrid seedlings at US$ 0.50 per plant. Testing in Africa is showing positive results. In Tanzania and Nigeria, for example, FIAH and other varieties are now grown by more than half a million people and yields have increased from 5-20 kg a bunch to 40-110 kg a bunch. "I am convinced that FHIA-01 would immediately double production for the 70 million Africans for whom plantains are a staple food," says Dr Phillip Rowe, head of the Honduran project. On the main export markets - Europe and North America - the FIAH bananas however will have a more difficult task. The new variety has a distinct flavour of apple.